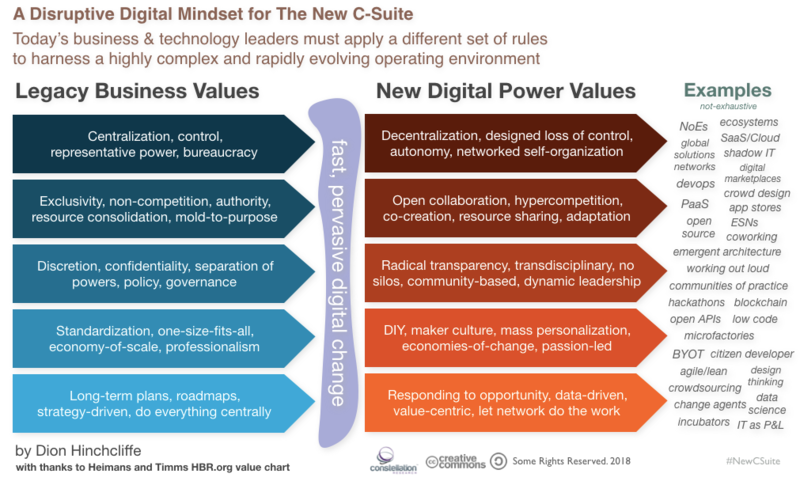 The Digital Power Values for The New C-Suite: The Modern Mindset of the CEO, CIO, CMO, CDO, CCO | Constellation Research Inc.
As digital has become core to the very foundation of how the most organizations operate today, the nature of the leadership required at the top has fundamentally shifted along with it. Based on my observations and work with C-level leaders in digital transformation over the last several years, we've reached the point where a marked shift has begun to happen. This shift isn't related of the usual combination of skills, experience, and ability of top leadership required in the enterprise, though those still matter to a good degree. Instead, it's a more profound transformation in the underlying mindset and inclination of executives in what they perceive as the most effective way to think and function in today's far-more-digital operating environment. Collectively known as The New C-Suite, and well represented by the Business Transformation 150 which we assembled last year, these emerging new leaders look at their organization and the world rather differently than in the past: They are quite technologically savvy, intimately familiar with the digital landscape, they tend to exhibit what Ray Wang calls dynamic leadership, they know how to lead via digital networks, and they have a good understanding of the art-of-the-possible when it comes to digital transformation. But most importantly, because it helps them properly appreciate the very different and more powerful thinking required in a digital operating environment, is that these digital leaders have a uniquely adapted, and one could even argue, a more evolved value system. The concept that digital imposes a fundamentally new hierarchy of what matters, what works effectively, and what creates value isn't a new one. Years ago I explored in detail many of the known digital power laws that constrain and guide the technological universe. These power laws largely govern the success or failure of a product, service, or organization functioning largely in the realm of the digital universe. While these power laws -- potent concepts such as Moore's Law and network effects -- are typically understood rather well by the digerati and the startups that have done particularly well, they are still not generally well-understood by the traditional executive. Describing these in business terms is the purpose this view of digital power values. So for 2018, I've updated my latest chart of the new digital power values with some key adjustments that helps make it easier to understand how to tap into digital thinking in a more natural way, given that our organizations must operate highly effectively in a mostly digital environment going forward. While studying power laws is always a good idea for anyone trying to understand the basic rules, enablers, and constraints of digital networks and ecosystems, it's often easier to think more conceptually about what matters most when it comes to the resulting values from a business perspective. To that end and to make this topic readily accessible, my chart is loosely based on a popular one that many executives are already generally familiar with, namely the anchor visual in Heimens and Timms influential Harvard Business Review article, Understanding "New Power." In my chart, similar themes are broken down from top to bottom, moving from legacy business values to new digital power values. I also include key examples on the right as widely-known reference points to make the concepts more understandable and to encourage further study. Key changes and additions for this year include a more mutually adaptive approach to digital change. The steady rise and increasingly high profile of design thinking in customer experience, for example, has shown that digital products and services must be built with greater empathy for the problems they are trying to solve and the people that they must service. Digital leaders must impose their own will to the extent that they have conceived of all new and better ways of digitally meeting stakeholder needs, but deeply understand those needs in the first place and be ready to adapt to them profoundly. I've also added economies-of-change as a new digital power value this time around. We've come to understand clearly the growing gap between digital leaders and laggards, and one of the most important traits of a digital leader is speed of execution. For example, pressure to go faster was the very top external pressure in my market leader CIO survey last year. Finding ways to change faster, such as building networks of excellence (NoEs), harnessing digital change agents, and designing for loss of control are groundbreaking new techniques to go much faster (and to do it much easier), but are only the beginning. We must continue to search for, locate, and wield economies-of-change like never before if we're to become digital leaders and sustain our position. This new power value encourages us to be on the look out for just such breakthroughs in our own industries and organizations. Finally, while other small tweaks have been made, one of the other key additions is being strategically data-driven, as opposed to more strategy driven. This is not a binary recommendation, as strategy can still be important when it comes to having a framework for responding to opportunity that is seen in the data. However, using data can tell us vital stories and guide us in all new, unexpected -- and often far more valuable -- directions better than any a priori strategy can. I've been hesitant about including this power value until now, despite the great industry obsession today about analytics, business intelligence, machine learning, big data, and so on because my research shows that our data is still spotty and not high quality enough of the time for many of us to truly be data-driven. Also, we're still fairly immature at removing the bias from our data, which can lead us astry in unexpected ways. However, I believe we've now reached the point of no return. Organizations that don't use data to drive their operations and strategic decision makng far more than in the past will be at a major competitive disadvantage. Maintaing data supremacy based on sound and operational data science is the future of business. There's a lot more to these power values of course, and I'll continue exploring them over the coming months. For more details on technology and business trends that directly inform these power values, I encourage you to read my complementary new 34 page report, Astrochart for the New C-Suite.